Design, preparation, installation and evaluation of an EcoCooling system to provide cooling to a server room. An Ecocooling evaporative cooling system made up of 1 EcoCooler unit. Monex financial services is a rapidly expanding killarney based enterprise in the financial data processing sector. The company, which handles information such as credit card transactions on an international scale, requires the integrity of its server room to be paramount. The environment of such a facility must be maintained within the servers working parameters. 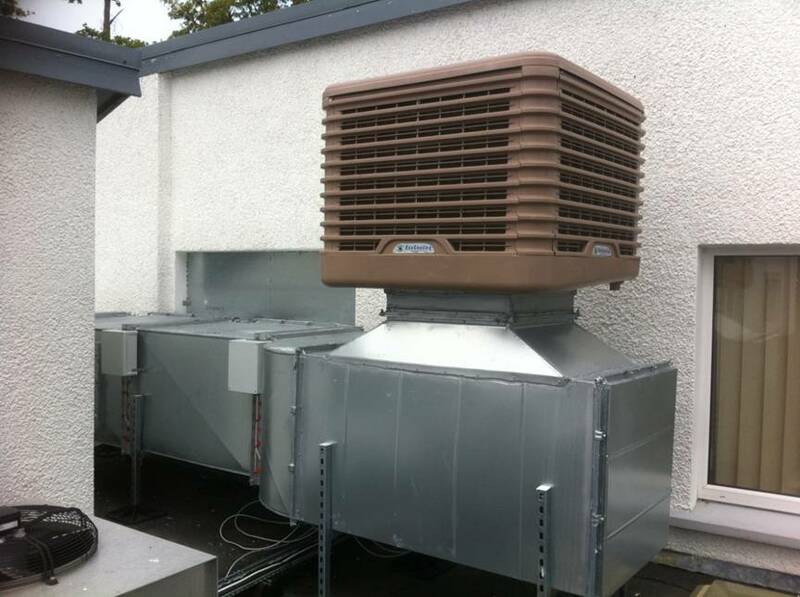 Airflow services installed an EcoCooling evaporative cooling system with the EcoCooler unit mounted on the roof of the building. The installation was discreet and required minimal alterations to the aesthetic of the building. The system ensures cooling to the businesses server room while also reducing upkeep costs and carbon footprint for the business when compared with more traditional methods of cooling. The system is simple in design and allows for dynamic cooling temperature control based on the requirements of the room. Design, preparation, installation and evaluation of an EcoCooling system to provide cooling to a server room and an IT room. 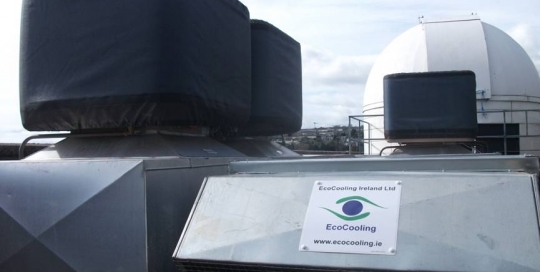 Two Ecocooling evaporative cooling systems made up of 3 EcoCooler units and 1 EcoCooler unit. Trend Micro is an Asian based global leader in software security. The company has offices on the western edge of Cork city which serves as the EMEA (Europe, Middle East and Africa) HQ of the company. The site contains server rooms and working space for its 250 employees. Airflow services was tasked with introducing 2 different cooling systems for areas within the facility on the model farm road. 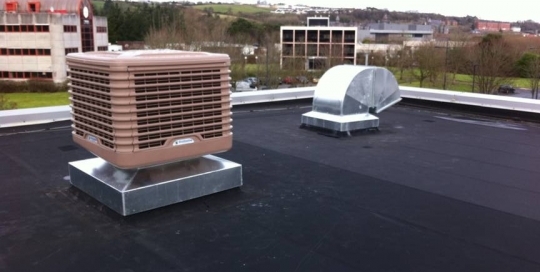 EcoCooler was the ideal system for trend micro’s cork branch. 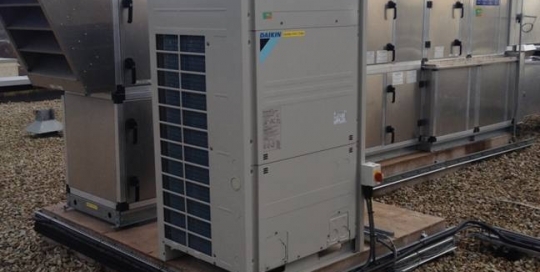 One system required 30 Kw of cooling to permit the required environment that their large server room demands. 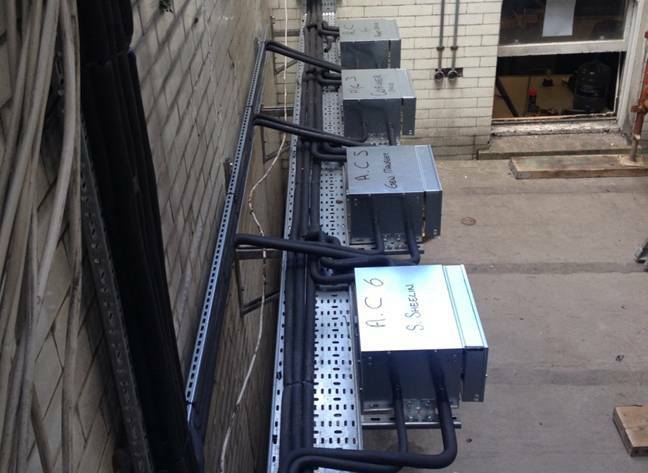 The second system requiring 20Kw needed to provide clean, fresh, cold air to one of their IT rooms. Previously the room which was often too warm due to surrounding server rooms and during working hours is occupied by IT staff of the software company required comfortable working conditions to be delivered through the cooling system. The EcoCooling systems installed allowed an effective eco friendly design that had low upkeep costs and controlled conditions such as temperature and humidity for the environmental needs of both the servers and the IT staff. The AIB branch on 66 South Mall is the largest of their branches in Munster. The building is one of the finest examples of 20th century architecture in the city of Cork as the majority of this building (formerly known as the Munster/Leinster bank) was constructed between 1909 and 1922. Airflow services is proud to have done business in 66 South Mall for many years. 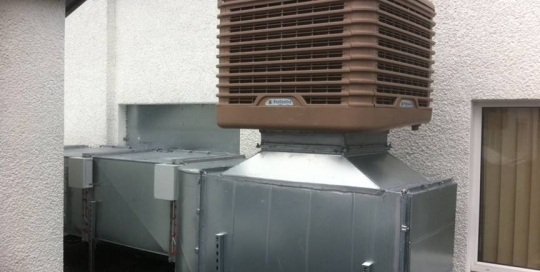 From July 2014 to January 2015 Airflow installed 5 new air conditioning systems as part of completely replacing the R-22 systems that were used in the building previously. The new systems, which use R-410a gas replaced multiple older systems throughout the entire building. These new air conditioning systems allow clean, fresh air to travel to the luxuries commercial interior of the financial centre. Offices, customer areas and meeting rooms maintain optimum temperatures using the dynamic cooling and heating systems. The utmost care and preparation was taken so as to preserve the building and not interfere with business as the installation of these systems was carried out while the building was live as well as outside of working hours. 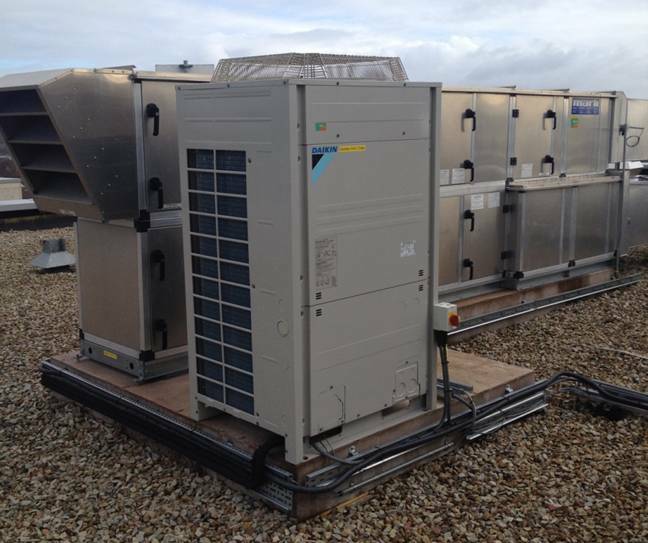 EMC’s campus in Mahon has a large number of heating and cooling units installed on its premisis. The american based technology company started to set up their second working campus in county Cork in 2013. The new site which employs around 200 people is located in the city gate business centre in mahon. Airflow services installed systems which provide heating and cooling to 158 different indoor units throughout the facility. 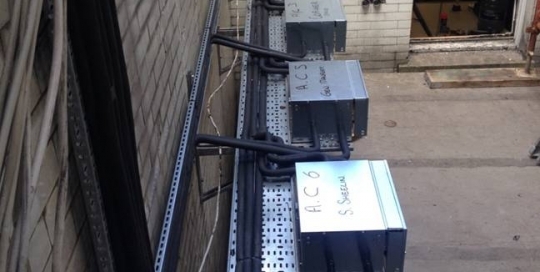 The project, which took place in the summer of 2014 was to install these units which source cold fresh air from the network of condensers on the building’s roof. A large ventilation system was essential to the project and Airflow was was involved in the construction and balancing of this also. 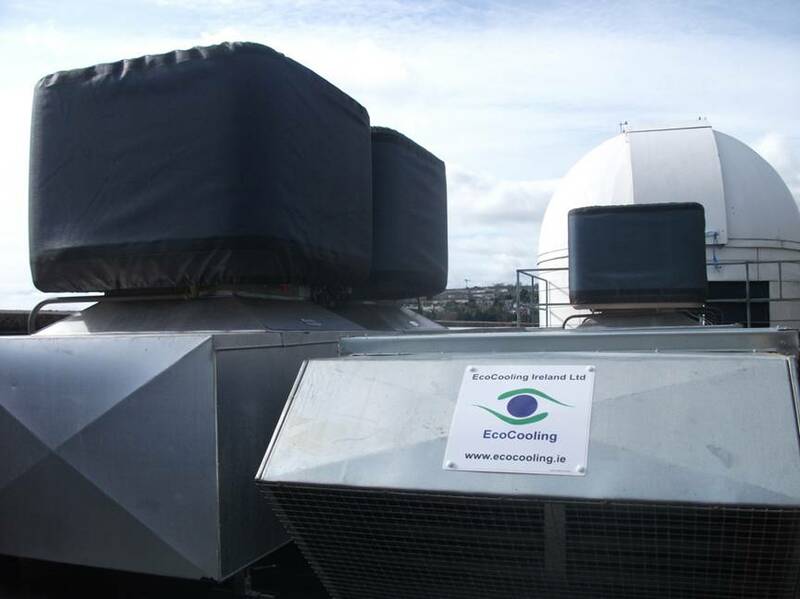 University College Cork has installed an ecocooler evapourator system to keep temperature sensitive areas at a reliable constant. They chose the ecocooler system as it hugely reduces the electricity consumed when compared with traditional air conditioning systems and lowers the carbon footprint also. 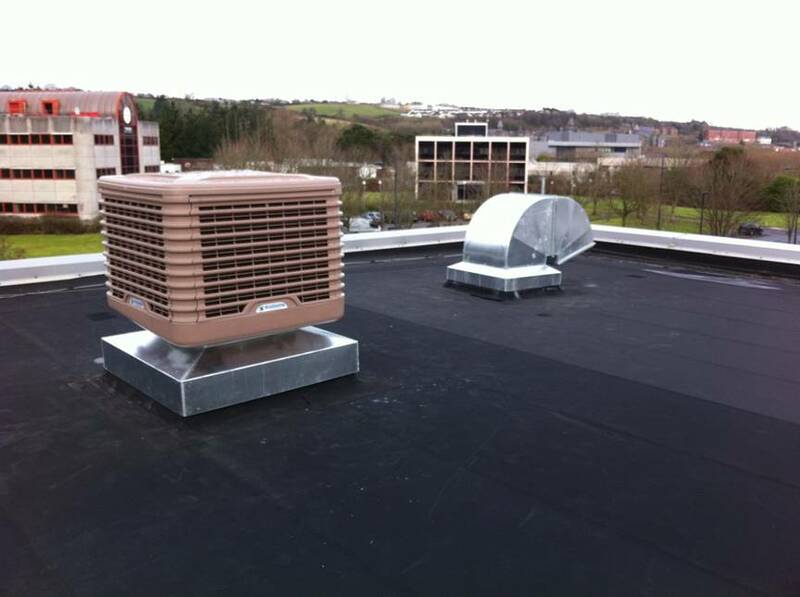 The Kane building has a network consisting of 4 wetbox ecocoolers which are mounted on the building’s roof. This dynamic setup is used to maintain an optimum temperature within a server room within the building at all times. The system uses a fraction of the running costs when compared with traditional air conditioning systems and reduces the carbon footprint by up to 96 tonnes of carbon per year. University College Cork’s food science building also has a smaller system which uses just 1 discharge ecocooler to control the temperatures within a freezer room. The setup provides 3m3/s of airflow to cool the 30kW needed within the room. Like the previous network of ecocoolers this one also substantially reduces upkeep costs and helps reduce the buildings carbon footprint.